Photo. 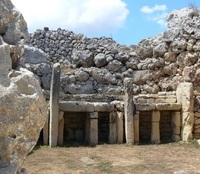 Temple at Ggantija near Zaghra. Made some 5,500 years ago. Malta`s Gozo remains largely unspoilt. The island has scenic hills, which are featured on its coat of arms. On my tour for almost ten years ago I could admire the Azure Window, a natural limestone arch that was a remarkable geological feature, until its collapse in 2017. The Azure Window had been a national treasure for years so I can understand it was a big disapointment when it broke. Parts of the top slab began to collapse between the 1980s and the 2000s, with initial sign of collapsing in 2012, so it was expected that it would break, but no so early. The Azure Window, known also as the Dwejra Window, was a natural limestone arch in Gozo, located in Dwejra Bay. It was a massive tourist attraction for numerous reasons. Apart from its natural splendour, it was also featured in numerous films and TV series, such as Clash of the Titans, The Count of Monte Cristo, Game of Thrones, The Odyssey, and more. Further more I got a fantastic view over Rabat. The Cittaddella also known as the Castello, is a citadel in Victoria on the island, visible from almost every corner. Many churches here. For more Dwejra goodness, check out the Inland Sea, which a saltwater lagoon that connects to the Mediterranean Sea by way of a natural tunnel arch. The tunnel is wide enough that luzzijiet can pass through it on calm days! The Blue Gotto is located near ‘Wied iz-Zurreq’, south of Qrendi, This is the largest cave out of a group of caves in the same area. You can only reach The Blue Grotto by boat, and it definitely makes for a serene experience. People believe that this is the cave referred to by Homer in the iconic ‘The Odyssey’!